I miss coworkers. Sometimes. Granted, I no longer have to listen to Ned from Accounting complain about the quality of coffee or Mabel from Client Services go on and on about her cats, but I miss the comradery and the ability to bounce ideas off of people. I try to do client or candidate lunches once or twice a week. Some days I will sneak out to the gym just to see another person during the day, because once in a while it feels isolating. Be prepared to redecorate. Believe me, this was on of my biggest surprises. Spending hours on end in your abode will make you realize that cannot stand the paint color in your immediate work area. It started to feel too dark, so I painted it. And then the bedroom looked too dark. And then the guestroom. If the dog stands still long enough, he may get a coat of paint. My dry cleaner misses me. We used to be on a first-name basis. Now I am just some person who brings in her “fancy” clothes every few weeks since the days of suits and dresses are few and far between. Now I work in yoga pants. You know it’s bad when I justify that they are my “dressy” ones, though on the plus side I am saving a considerable amount of money. I now regret the money spent on shoes (okay, not really…) It’s just a wee bit challenging to justify what I spent on my shoe obsession when I now spend most days in gym socks. Same for the suits and dresses that now collect dust. If you believe that working from home will be your reality for the foreseeable future, consider paying it forward by donating some of your former work wardrobe to an organization like Dress For Success. Maintain a Network: If you work remotely, you can still have a relationship with colleagues, albeit virtually. However, having people you see live and in person can be crucial to your sanity. Join a networking or professional group to ensure that you maintain much-needed, real, live contact with others in your profession or industry. Those appointments that I used to schedule way in advance are a breeze. Those annoying four hour windows from the cable company? No problem! I’ll be here! Doctor has nothing in the evenings or Saturday for months? I’ll take that random Tuesday afternoon time slot! Toilet paper. Not to be indelicate, but you never think about that when in an office. Ditto for water, pens, post-its, and coffee/tea. In an office, those things somehow magically appear. You will be amazed at how quickly you run through them. Be sure to stock up. Time Management. Without the normal office cues to indicate time, it is so easy to get sucked down the rabbit hole of a project, look up, and realize the day is gone. You do not see people coming and going, or have the same number of meetings to break up the day – it is great because it keeps me focused, but sometimes I need to set a timer so that I remind myself to take a breather. Family and friends think I am free to play. Set boundaries if you start to work from home. People assume that it means that you can chat on the phone at any time or meet them for downtime when they have a day off. That is not the case. I am working from home, with a big emphasis on the w-o-r-k.
MOVE! Living in the city, I often walked a mile to and from the office, and clocked thousands of steps while there going to meetings or to grab lunch. Now I need to remind myself to move. One thing that helped my waistline is the lack of the office candy bowl and endless birthday cake and leftovers from catered lunches, and if I ended a conference call in the office and started doing pushups, I would have been looked at funny. At home, it is a judgment-free zone. 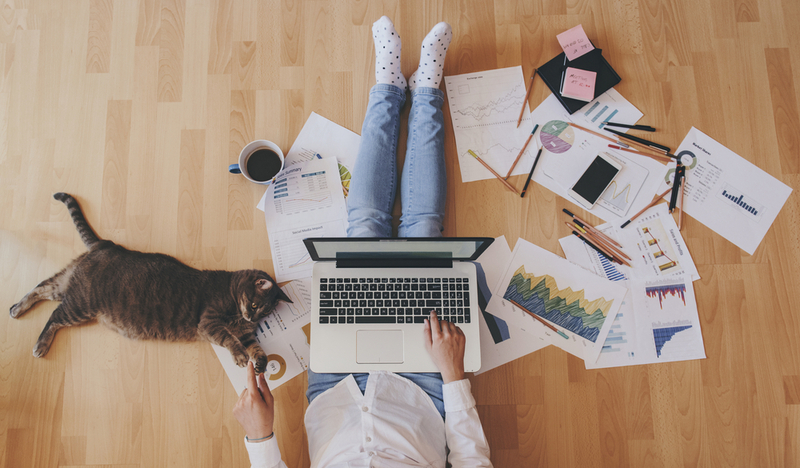 There are a million perks to working from home, and if you can work around the very few challenges, you may just find your professional utopia. Good luck with it! Hire the best! With personalized service and proven results, Pillar Search & HR Consulting provides retained executive search services and human resources consulting for exceptional non-profits and socially responsible for-profit firms. A woman-owned business, Pillar is based in Boston, MA, and works on the national level. To learn more about how Pillar can assist with your hiring and human resources needs, please contact Cindy Joyce at [email protected]. My name is Cindy Joyce, and I am the Founder and CEO of Pillar, a woman-owned executive search and HR consulting firm. My reputation was built on finding the very best candidates, building lasting client relationships, and promoting a strong organizational culture. In my twenty years in recruiting and human resources, I have worked with outstanding nonprofit and for-profit organizations. I had my Jerry Maguire moment, and with that, Pillar began. Since that time, I have worked on searches for exceptional nonprofit and mission-driven clients for searches including President/CEO of the New England ACH Association, Revenue Accounting Manager for Reading Partners, Director of Advancement for The Landing School of Boat Building, Director of Sales for Uncommon Cacao, Director of National Accounts for Year Up, and President of Yestermorrow Design/Build School. Prior searches included Executive Director for City Year, President of the Emeril Lagasse Foundation, Director of Environmental Policy for Harvard Law School, Director of Development for Nantucket Athenaeum, and Director of Advancement for Santa Barbara Film Festival. I have appeared on BBC‘s World Have Your Say, been a featured speaker/presenter with the Lean In, Harvard, PwC, Junior League of Boston, and Materials Research Society (MRS), and my writing has been featured on LinkedIn Pulse and in several blogs. My personal volunteer experience has including fundraising, actively serving on a nonprofit board, leading a human resources membership group, serving as a LinkedIn Hiring Advisor, and promoting economic empowerment, promoting the arts, and mentoring students. For my full background, I invite you to view my LinkedIn profile, and encourage you to contact me about your hiring and human resources needs.